Kenneth Baker and Sarah Thornton in conversation, with Jennifer Dalton & William Powhida artwork on the screen, at the Town & Country Club, San Francisco. The last several weeks have been fun soaking up the plentiful arts in and around the Bay Area. I am lucky to call the East Bay my home base now, and have equal access to both sides of the bridge these days. My recent odyssey began with the kind invitation by a friend to attend a talk and luncheon at the Town & County Club in SF. The guest speakers were SF Chronicle art critic Kenneth Baker and ethnographer Sarah Thornton in conversation about her latest book, 33 Artists in 3 Acts. Lucky for San Francisco, Ms. Thornton will be calling the city by the bay her new home. My SF still life...The Thing Quarterly finds, David Mitchell announcement card, Tony DeLap book, Ai Weiwei @LARGE site map. 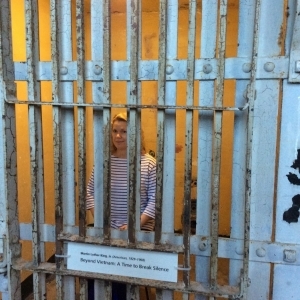 A few days later I was back in San Francisco on a gorgeous sunny day to see the Ai Weiwei installations at Alcatraz. The show was impressive in its scale, generosity, and temperament. Wesley in between Claire Colette's graphite drawings at The Berkeley Art Center. Later in the week, I saw the Claire Colette and Rhonda Holberton exhibitions at The Berkeley Art Center. My son was mesmerized by both exhibits and continues to talk about Rhonda's video piece, and Claire's crescent moon drawing installed high up on the gallery wall. A week later, back in SF to see some great painting shows, I checked in with artists for a few forthcoming New Collections series, and visited with clients. In the studio with Paul Mullins -- getting excited about debuting his new series Wish In the Other for a forthcoming New Collections series on the HMxAA SHOP. Maysha Mohammedi at Mark Wolfe, San Francisco. Jaq Chartier at Dolby Chadwick, San Francisco. On the walk between galleries and visits, I was thrilled to see the new SFMOMA rising. New SFMOMA rising off Mission Street. I closed out these busy Bay Area art weeks with a final dinner at one of San Francisco's landmark restaurants, Capp's Corner. This was the site of my first date with my husband, and many evenings with family and friends in the early days of my life by the Bay. One last stop with the family was bittersweet, but deliciously old school and yummy. Ciao Capp's! Moving forward, please stay tuned for upcoming highlights of the art fair filled weekend May 1 - 3 in San Francisco. Welcome to my journal of art and life. Please be aware that you will be subjected to offbeat musings, fabulous art observations, occasional art gossip, and quite likely some skewed prose.